A grieving Pakistan's policy shift towards the Taliban has comes at great cost, says Shahzad Raza. 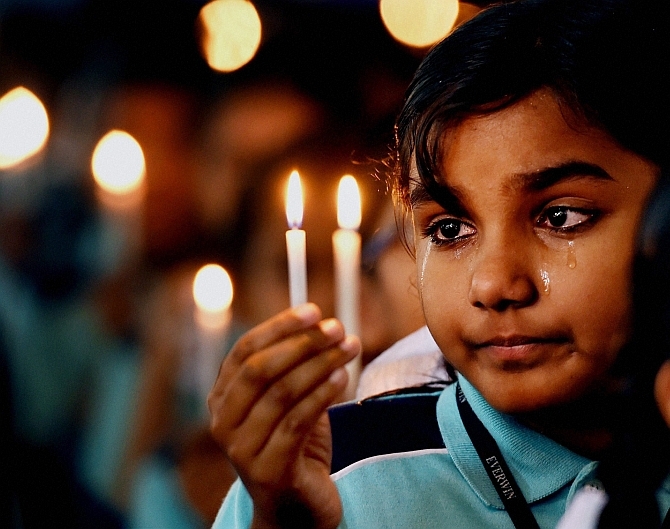 Image: A child weeps at a candlelight vigil for the victims of the Taliban attack on the Peshawar school. It was a day of mourning, consolation and new resolve in Pakistan. Families buried their loved ones and people offered symbolic funeral prayers across the country. The entire nation wept. The leadership made another pledge. If their words are to be believed, there will not be any distinction between good Taliban and bad Taliban. Both the political and military leadership congregated in Peshawar to show they were all united against the common enemy. For decades, the debate revolving around the efficacy of the good Taliban and threats of the bad Taliban have dominated the national discourse in Pakistan. Not any more, it seems. But it came after a huge sacrifice. Though over 60,000 Pakistanis lost their lives since the so-called war against terror began, the massacre of 132 innocent school children on December 16 has shattered every peace-loving Pakistani. 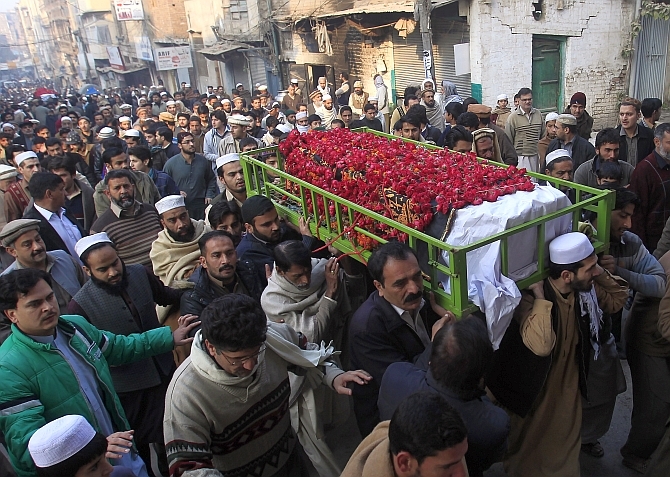 Image: The coffin of a student killed in the Taliban attack on the Peshawar school. Wednesday morning began with the prime minister's decision to end a moratorium on capital punishment. The terrorists, sentenced to death by the courts, will be executed soon. Pakistan had observed a moratorium on capital punishment for the last six years. 'We will take revenge for every drop of blood of our innocent children,' resolved Prime Minister Nawaz Sharif while chairing an all-parties conference in Peshawar. His opponent, Pakistan Tehreek-e-Insaf chief Imran Khan, who wanted Sharif to step down for allegedly rigging the 2013 election, also attended the conference. Khan called off his 126 day protest outside the parliament in Islamabad. 'We will support (Prime Minister) Nawaz Sharif to combat the menace of terrorism,' Khan declared, reminding him to fulfill the promise of investigating the rigging allegations. Or, else, the protests would resume. Soon after the all parties conference, army chief General Raheel Sharif made a quick trip to Kabul along with Lieutenant General Haroon Akhtar, director general, Inter-Services Intelligence. They held meetings with Afghan President Ashraf Ghani and ISAF (International Security Assistance Force) commander General John F Campbell. Military sources said the Pakistan generals demanded swift action against Mullah Fazlullah, the chief of the Tehrik-e-Taliban Pakistan. They believe Fazlullah is hiding in the Kunar or Nooristan provinces in Afghanistan. 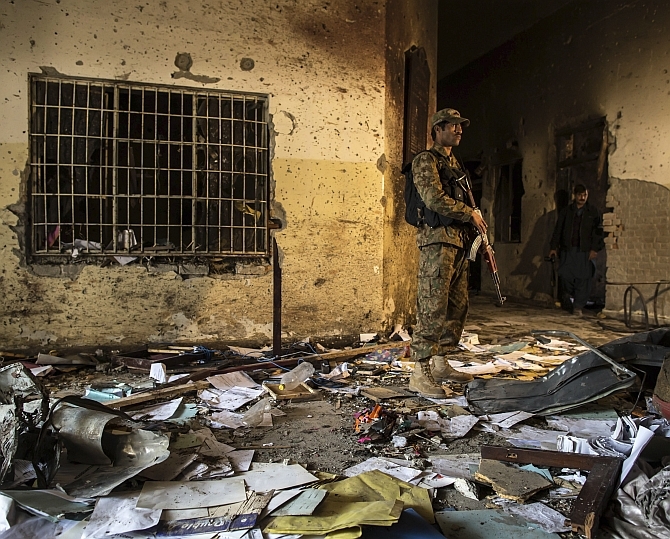 Initial investigation by the intelligence agencies noted that that the terrorists who attacked the Army Public School in Peshawar had come from Afghanistan. They believe Fazlullah and his operation commanders guided them from their safe havens in Afghanistan. Image: A soldier inside the Army Public School in Peshawar. The political leadership has decided to constitute a high-powered committee that will prepare a plan of action within a week. To some, it does not seem an appropriate idea. Former president General Pervez Musharraf has rejected the committee, saying the politicians should stay away from such decisions. Before the 2013 general election, the Pakistani Taliban specifically targeted the then ruling People's Party, the Awami National Party and the Muttahida Quami Movement. Their rallies were bombed, its leaders and workers killed. All three parties had denounced the TTP. The Taliban spared the Pakistan Muslim League-Nawaz which now rules the country, Imran Khan's PTI and other Islamist parties. The tone and tenor of the election campaigns of these political parties was rather soft on the TTP. 'Musharraf planned a bloodbath of innocent Muslims at the behest of others only to prolong his rule, but we in the PML-N opposed his policies and rejected dictation from abroad and if the Taliban are also fighting for the same cause then they should not carry out acts of terror in Punjab,' Chief Minister Shahbaz Sharif, the prime minister's brother, stated in March 2010. Imran Khan has always been short of condemnation about the Taliban terrorists. Even after the horrendous Peshawar massacre, Khan did not name the Taliban. In Peshawar, the provincial counter terrorism department has registered a case against the leaders of 16 terror outfits, including TTP chief Mullah Fazlullah. Others Taliban commanders named in the First Information Report are Shakeel Khalid Haqqani, Mangal Bagh, Maulvi Faqeer and Aurengzeb. The attackers have been identified as Abuzar, Umer, Imran, Yusuf, Qari, Uzair and Chamnay. The police report says the Taliban wanted to attack the school to give a 'strong' message to the Pakistani army for its military operation in North Waziristan. Tthe Taliban once again have established they are nothing but ferocious beasts who will stoop to any level of barbarity. It vindicated Pakistan's liberal left that differentiating between good and bad terrorists is a flawed and obsolete policy that will eventually destroy the country. 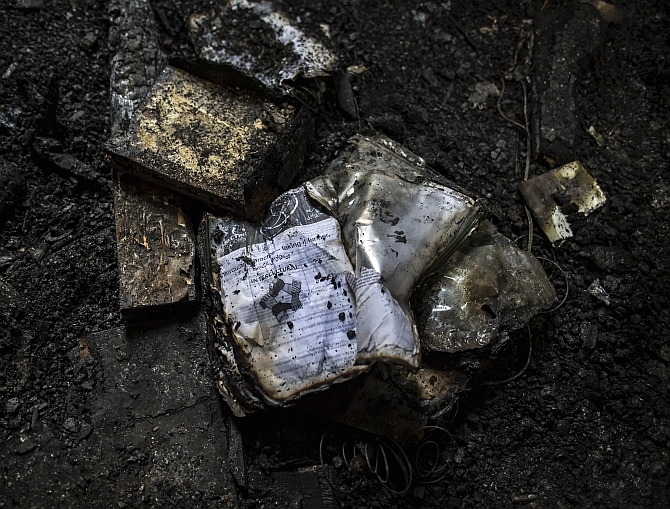 Image: Burnt books lie at the Army Public School in Peshawar. Later in the day, the military authorities permitted journalists access to the site of Tuesday's carnage. The seats of the main auditorium were soaked with blood. The white floor had turned crimson. Stench of burnt human flesh was unbearable. The walls of the schools were bullets-riddled. Some of the walls had caved in because of the intensity of the bomb blasts. Not everyone was killed inside the main auditorium. Some of the children tried to flee, only to find more killers in the corridors. The murderers ambushed the innocents without remorse. The barbarity was not confined to killing at point blank range. The attackers burnt at least a couple of teachers alive. Crumpled papers of notebooks were scattered everywhere. No one had yet removed the bloodstained shoes. Mobeen Afridi, 15, was a tenth grade student who died with his classmates. Mobeen had stood first in his class last year. He was the only son of his parents. Yet they showed extraordinary resolve, making people believe that their hopes were not dead. "I am proud of my son. From now on I will be called the mother of a martyr," his sobbing mother said. Shahzad Raza is an Islamabad-based journalist. Animals created by our rulers now feed on our children's blood!